If you have kids then you know how important toy storage is followed by books. Infact to keep your kids engaged and involved with not only playing but reading books too it’s very important to have book storage done very smartly and creatively. To start with Why Storage? I mean why having storage is so important? Designer – In kids room you will have lots and lots of stuff. You have so many variety of things like books, toys, games, and much more. You cannot have stuff laying all around all the time. It will make you feel bad about it. I am sure you want your kid to live in healthy environment and organized life. You need to get those stuff out of your site. How? The answer is Storage. Storage for toys and games, Storage for books, props, and other display item. So, what are different types of Storage options for Kids room? i. The Actual storage where your kids can keep books and toys. Basically storage that takes stuff away from your eyes. This would include storage under or inside beds, wall unit storage, shelves. ii. Display Storage – This is storage where you could have display items that your kids love to see, may be their favorite prop or statue, soft toy, cars, showpieces something they that need not be used. You usually have shelves made for such display storage. One can get creative wall unit made in different colors to make it attractive and have balance with room interior theme. Such display units adds to room aesthetics. They add style to your and your kid’s room too. 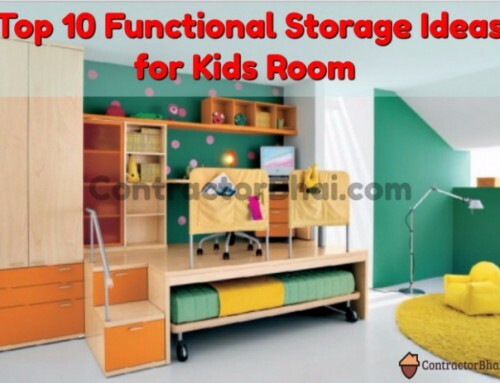 How is designing or having Storage for kids room different from adults room? Accessible Height – You will find me using this word many times, but most importantly storage in kid’s room should be at accessible height. In adults room you can have storage made at any height since they could easily use a ladder or table to climb and access their storage. I am sure you wouldn’t want to risk your kid’s life by doing this. Kids anyways are very adventures. They would love to climb and hop onto stuff placed at higher level more out of curiosity. you are not there to assist you kid 24×7. Imagine your kid falling form a height. Ouch, more than the kid you will be hurt. So best is to avoid it. Have their toy storage and daily required stuff cabinets and drawers made at a height where they can easily garb. Rounded Corner – It’s a minor design feature which often goes unnoticed and unsaid. Have the furniture’s especially in kids room corners made into smooth rounded corner. This is to protect your kid from being hurt that could also cause serious injury while play. Strictly avoid sharp corners. If you already have furniture with sharp edges that is being used, please cover the corners with “Kids Proofing corner guards” or with “Child safety Cushion Strip”. These products are easily available online. Safety come first especially when it comes to kids. Easy Access – Well if you have toddlers, they surely are not going to open drawers or cabinets to take out toys or other stuff. They may try as and when they grow. Have storage for toddlers made at height you can easily reach when toddler is around. As your toddler grows, learns to walk and catch hold of things, they will play with more toys, they will want to explore things. You therefore need to be careful, attentive and clever with different storages. A kid will learn to open any kind of storage only when her turns 4-5 years of his age. Here I would like to emphasis that have storage made at accessible height. Avoid tall units. If at all you want tall unit, store unwanted or no needed stuff on higher shelves of that unit so that the kids doesn’t try to climb over shelves to get hold of his stuff. You spoke about kids is the only room one can get most creative. So can you really go creative on storage too? If yes, How? Designer – Well there’s no end to creativity. You can definitely go creative on storage too. 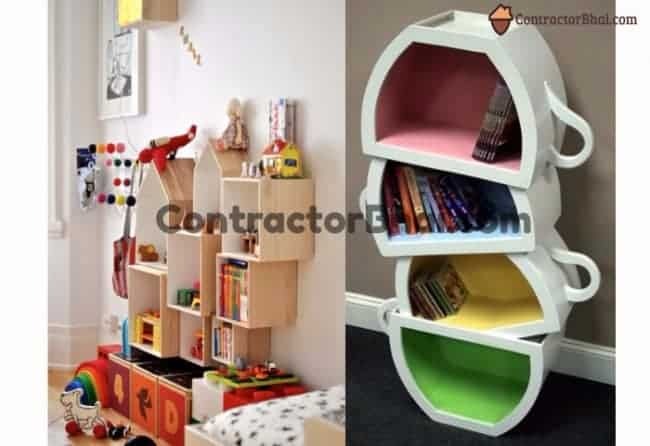 You can have bookshelf made in geometric form or different shapes for kids to understand different shapes. Another aspect of Color Scheme. The shelves could be painted in different colors. Let’s say there are 3 or 5 shelves made on a wall, you could have them created at different levels ( in slant way of one above the other, etc.) Paint the odd one’s with one color and even with contrast to make it appear attractive or different shade of that color. For seven shelves on side wardrobe, you can get it painted in rainbow colors.Well there is no 1 answer to it. Designer Pitch – Go creative but don’t overdo. 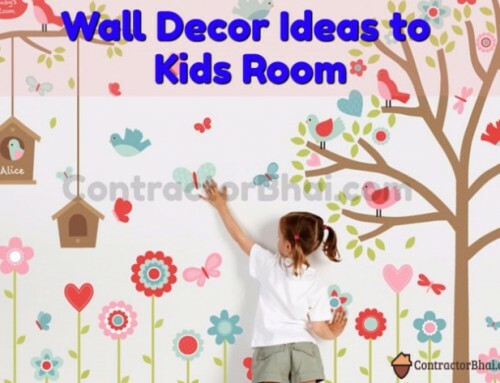 For kid’s room you already have theme based wall-covering, wardrobes and furnishing. Doing up display furniture or storage too as per theme would be a little too much. Again let me remind you that furniture is something permanent unless you plan to renovate your house. So keep it simple. As I said max. to max. Paint in differently or give it a shape. Not more than that. 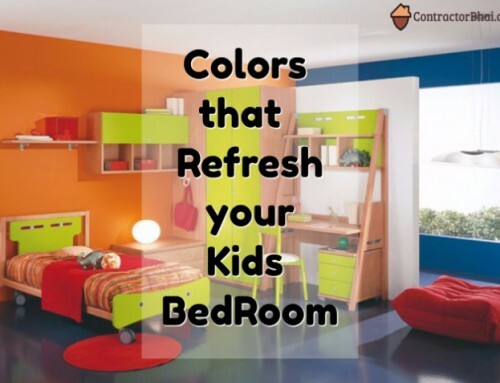 What kind of furniture is good to have for kid’s room, Ready-made furniture or Carpenter made personalized furniture? Designer Pitch – You mainly have 3 kids of furniture. Ready-Made furniture – that is available in most local shops. ii. Modular Furniture – Made in factories, available with proper furniture showrooms and certified vendors. Carpenter made Furniture – his is the traditional way making furniture. Ready-made furniture looks very attractive. It is available easily for good rates. But major drawback is that you don’t really know that material used for that product. The finish of Ready-made furniture is no doubt very beautiful and attractive that you would want at first instance. And for the price the sell, any one would be compelled to buy. But here’s the hidden truth. The Material used inside the main covering is inferior quality wood. This kind of furniture will not last for long may be say 3-4 years max to max. 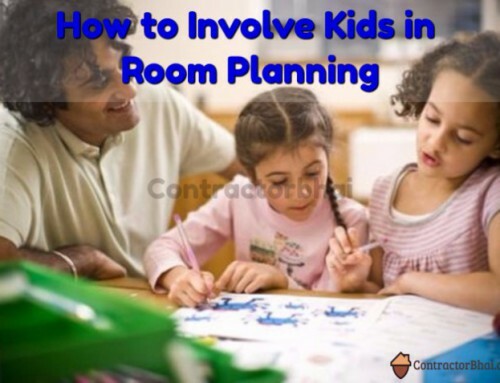 Well you could have 1-2 items of your kid’s room that are ready-made furniture. Those furniture’s that you probably do not want to have for more than 2 years say. For example Chair. Chair is something that you surely wouldn’t get it made because your kids is growing neither he will want a huge chair nor too small. You can buy a ready-made one as per his age and needs. Modular furniture’s are those that are factory made furniture’s. You can find modular furniture’s in furniture showroom. These could be custom-made, i.e. as per your room size and other few requirement. Like you can have kids bed, wardrobe, etc. as modular furniture in kid’s room. These are easily available in different kids theme. 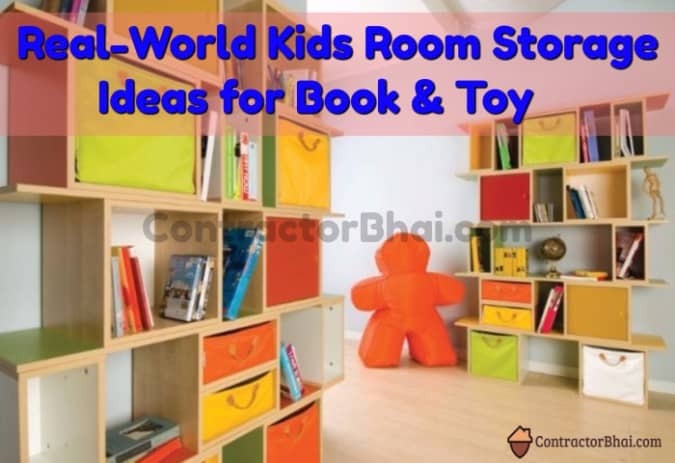 You can select one as per your kid’s room interiors. And lastly Carpenter made furniture is the traditional way of making furniture where the carpenter comes in, takes all the sizes and furniture requirements from you. Get plywood, laminate and other accessories. Sits at your place and makes it. This is the most time –consuming way to having furniture, but for sure to last for years to come. Here you can get a personalized touch to every piece of wood. So you see there is no 1 answer to what kind of furniture is best. 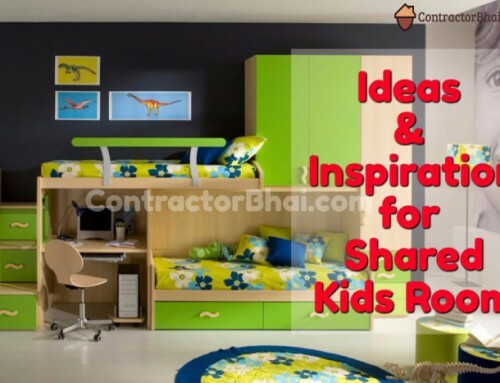 One can buy or have furniture as per kid’s needs and requirements. 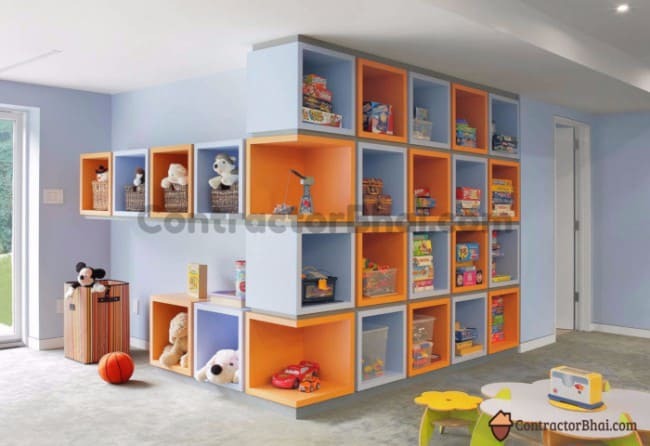 According to you what material shall be avoided for kid’s storage or in kid’s room as such? Designer – Avoid using glass doors for or on wardrobes or storage units. Glass door units with spot lights inside definitely look very trendy and attractive. But avoid this type of storage in kid’s room. Have them in your room i.e. adults/ parents room but not kids room. Also avoid mirrors in toddlers and growing kid’s room. Reason, kids spend most of their time in their room playing, studying, etc. What if the glass or mirror gets hit by sharp or heavy object? Your kid is in danger. Your dear kid may get hurt or have deep injury due to cracked glass or mirror. I am sure no parent would want that to happen. Well if you or your teen have a special liking for glass you can go for clear glass doors with proper framing on all sides of the door. Glass door with thin metal framing looks really trendy but avoid. Also have such doors of cabinets used on higher level storage options. Such storage’s are often used for display items that look very attractive. What other kind of or style of storage options would you suggest for kids room? Designer – Have drawers or pull out basket for trolleys for kid’s room storage. This may sound like kitchen storage furniture but this style of storage is very beneficial in kid’s room too. You know kids probably have more stuff to store than anyone in house that are required on daily basis like books, toys and other stationary items. With pullout baskets and trolleys they can have access to all items in that storage. Unlike cupboard of cabinets kids wouldn’t have to spend time looking for what they want. When you have deep cupboards or cabinets what may happen is that the kids may have kept some stationary or book deep inside. He may forget about it and that item stays forever that may spoil after a period of time. Surely you cannot have drawer system storage everywhere, but where ever possible like below beds, flooring storage cabinets, etc. have pull outs storage’s. Designer Pitch – For no floor storage space, you can get below 2-3 drawers or trolley system storages made below main wardrobe. This could be used to store toys, book and other stationary items differently. For such storage styles its best to have trolleys made of steel. Main advantage of having steel trolleys is that they do not catch dirt easily as like wooden or other material drawers would. Also they are easy to clean. With shelves storage options, they would have to be cleaned on daily basis. The trolleys could be cleaned once a week or even a month may be. They do not regular cleaning. Lastly, No matter what style of design of storage furniture you get made of buy, most importantly see to it that they have smooth rounded corner. Avoid sharp corner that can hurt your kids or cause serious injury.